Richard applying the last touches on a finish process with too many steps to count. We’ve heard the unbelievable stories about how workers of yesteryear cranked out huge amounts of high quality work in an insanely short period of time. There’s no way to confirm the exploits of Paul Bunyan and his blue ox, but I can share with you the work of one amazing chair maker. I stopped by Richard Grell’s shop today to see an order of chairs and tables he’s been building all winter. Here’s a peek at the 54 chairs and nine tea tables that will ship this week. Every part, every spindle, and chair seat fashioned by hand. Richard did call on a few trusted helpers for items like the painstaking job painting the miles of pin-striping. He’s been making chairs for a living for over 40 years and still passionate about the craft. That makes him a hero in my book. 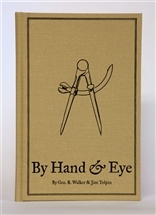 I’m excited to announce the launching of a new website, http://www.byhandandeye.com. Jim Tolpin and I have teamed up again to create an on-line resource for woodworkers to improve their design skills. The new website will be the home of an on-line design workshop series (slated for release in early May 2016) as well as plenty of practical layout and design related articles and video clips about design. We also have plans to use the site as a platform for gathering a woodworking design community and we look forward to rolling that out in coming months. I’ll continue writing here on this blog, but I am delighted to be working closely with Jim again to create something long overdue. Go check it out at http://www.byhandandeye.com. Tucked away in an alcove in the Springfield Museum of Art this 19th century desk begs more questions than answers. The form itself is typical of furniture built in a rural setting by a cabinetmaker who sparingly added a few touches of ornament in arches above the doorways and a few curves on the base apron. Then something wild happened. Another artisan, possibly 50 – 100 years later carved the existing desk lid and chest facade with a riot of poppy flowers and vines. If that was not enough, they put an exclamation point on this oddity and ebonized the carved panels. The museum attendant had no idea of the story behind it and one can only guess. The carving is expertly done, so much so that it makes one wonder why the carver went to so much trouble to mis-match it with this vernacular piece. It’s hard to imagine someone with so much talent choosing this chest for a canvas. Did they do this at gunpoint? Perhaps they were making a statement or making a joke. Any ideas why this might have came about? “Downstairs” is Seth’s word for my basement workshop. It’s a place where he can play with toys unlike anything from the McGiant toy store. “Downstairs” contains cigar boxes with string, old pulleys, hinges, and rubber bands. There are bins filled with cut offs, and the joy of double stick tape, and nails and hammers, and Poppy never tells him to stop making noise. He’s always dusting off some box of treasures I forgot about. Seth’s job is to point out the wonder in the everyday, and mine is to preserve that fire in his imagination. He’s much better with a mallet than he was last summer and just now getting the hang of drawing circles with a compass. Jim Tolpin and I have been thinking a lot about preserving the fire lately, and we have some fun and exciting plans in the works. I’ll have more to share about it in coming days but I promise it will be more fun than a cigar box full of string! “As I wrote earlier, too much thinking always makes for more choices and revisions. Alas, I think this is pretty close now. So, a quick description .. the fanback will now have two equally tall centers, 120 cm, with three descending pairs to either side. The four in the middle will have zero splay but some splay to the outer pairs. Approx ten degrees rake for all. As to the undercarriage, the frontpair will be square to the seat with the backpair raking back 25 degrees. As always, all input is valuable!